These days, most comedy clubs charge some kind of entry fee, with many venues opting for an additional two-drink minimum on top of the ticket price. Not so for Neighborhood Comedy Garage in tiny Yuba City, California. “It’s the only comedy club in America where the cover charge is a bean dip casserole,” says one of the garage’s earliest patrons and frequent headliners, Jon Law. A few years ago, one of Law’s friends from church cleaned out his garage and invited members of his community to bring their best potluck dishes (and jokes) for a night of yuks. Law, a house painter by day and a budding stand-up comic by night, says he’s “always felt personally responsible for entertaining everyone within a 50-foot radius,” so naturally, he jumped at the chance to make his friends laugh. The catch? In his comedy routine, Law primarily tackles a taboo you don’t often hear comedians talk about: cancer. It’s a topic the 57-year-old knows all too well, having beaten the big C on three occasions in the past four years. During that time, Law and his family have experienced their fair share of pain—but on the plus side, cancer has also given him some dynamite material for the stage. Did you hear the one about the time Law’s wife, Karmen Kortie, thought she saw a swarm of fireflies in their backyard? Law has jokes for days about his diagnoses, surgeries, and treatments, most of which are too off-color to print here. But what’s special about his story is that his family members—Karmen, his four children, and six grandchildren—have been just as funny along every step of his fight. The grandkids, for example, love to call their grandpa an alien because of the weird second hole in his belly, where a feeding tube recently resided. “I call it his blowhole,” says Kortie. “You have to have humor to get through this kind of thing,” she says. The first tumor was the easiest to handle. “Surgeons hacked off a piece of my tongue, I left the hospital, they got a clear margin, and everyone was happy,” says Law. By the next year, he and Kortie were married—which made his second diagnosis, another squamous cell carcinoma on the left side of his tongue in 2015, even more of a gut punch. The stakes were raised, but the newlyweds soldiered on. Doctors removed another chunk of Law’s tongue and opened up his neck to take out the lymph nodes on the left side as a precautionary measure. All clear. “Again, everyone was happy,” he says. 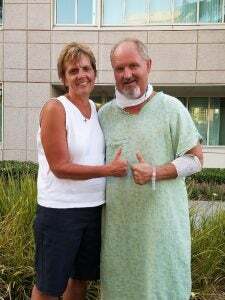 For two years after the procedure, Law regularly met with his surgeons at the University of California, Davis, and was given a clean bill of health each time. The appointments became less frequent, eventually shrinking from monthly check-ups to biannual check-ins. 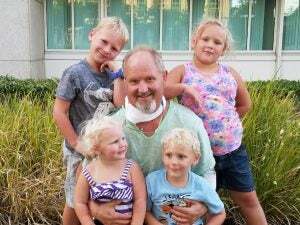 But then in May 2017, Law felt a nagging pain in his neck, which prompted one more biopsy. Law and Kortie wouldn’t stand for that. They’d beaten this thing twice, and they’d beat it again, vowing to do whatever it took to restore Law to full health once and for all. Law’s third surgery proved to be the trickiest, but this time they had a secret recovery weapon: Kate Farms’ Peptide Plus 1.5 formula. 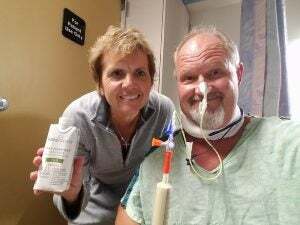 After Law’s operation, doctors told him he couldn’t eat any food through his mouth, because they wanted to prevent the hole in his neck from becoming infected. So Law spent a week with a nasogastric (NG) tube in his nose, which wasn’t exactly his idea of fun. “If I didn’t want to gag, then I wanted to rip that thing out,” he says. Law wasn’t free of feeding tubes just yet. Since the cancer came back for a third time, his doctors recommended a course of chemotherapy and radiation—33 sessions across 7 weeks—to make sure it would never return again. To combat the potential side effects, Law elected to have a tube inserted into his stomach. 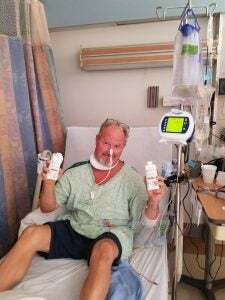 He used Kate Farms through the tube during the treatment and supplemented with it just after. “When you’re going through chemo and radiation for head and neck cancers, blisters can occur in your mouth, you may not feel like eating or swallowing, and you could lose your sense of taste,” he says. The tube was the right choice. Whatever comes next, you can bet they’ll both attack it with gusto. “We were put together to look at everything in life as an opportunity,” Kortie says. Or, in Jon’s case, a punchline for his next set at the Garage.